So you're taking the plunge, doing what you've always wanted to do but never thought you could...LEARNING TO KNIT! Congratulations, it is going to be a challenging and exciting journey. Thank you for allowing me to help! STOP BEATING YOURSELF UP! Give yourself a break, will you? All masters started out as students. You can’t be amazing at something over night. It takes time and patience. The same goes for knitting. Don’t have unrealistic expectations from yourself like making a sweater next week. Instead, take the time to learn the basics: Properly form each stitch, build muscle memory, build up your skill and knowledge. Remember, Rome was not built in a day and neither is a master knitter. Each step will be set up into lessons, and while learning the basics be sure and follow them in numerical order. After the basics, the order probably won’t matter an awful lot. It’s my opinion that more in-depth knowledge will make you a more confident knitter and it's my goal to provide that knowledge. So with all that in mind, what you will find here won’t be tutorials about how to work a pattern for a specific item or for any specific pattern stitch, just for the sake of a posting a new lesson or video. What you will find here will be the nuts and bolts of what is required to work those patterns and pattern stitches on your own, by reading a pattern or chart. There are hundreds of thousands of patterns on the internet and for purchase in books, magazines and leaflets. I think it's silly to limit yourself to the few patterns that someone might make available through a video tutorial. 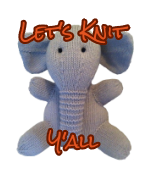 Dig in, soak up the information like a sponge then go out and be a capable and independent knitter. But don’t be afraid to ask questions when you run into trouble! No one is perfect and everyone needs help from time to time.